One way to put a cramp on your style and in your belly is to eat or drink the wrong thing. There’s a general saying “Don’t drink the water”, but it’s much more extensive than just avoiding drinking out of the sink. As a first time traveler, it’s important to understand that your body hasn’t developed the necessary defenses against certain bacteria. Not only that, but the process of travel is quite taxing – from the stress of catching transportation, to adjusting to different time zones, and being in close proximity to masses of people can really put a strain on your immune system. Of course it’s not all doom and gloom…. one of the best parts about travel is getting to experience different foods that you can’t get back home! Once you arm yourself with the right information you will see there are plenty of ways to avoid those dreaded symptoms such as nausea, vomiting, wrenching stomach pain, fever, etc, simply by taking the proper precautions and being knowledgeable about what you consume. Cryptosporidium can cause the diarrheal illness cryptosporidiosis. Cryptosporidiosis is typically an acute, short-term infection, but can become severe in children and people with poor immune systems. In humans, it remains in the lower intestine and may remain for up to five weeks. Giardia is a parasite that colonizes and reproduces in the small intestine, causing giardiasis. Human infections occur through ingestion of untreated sewage or contamination of natural waters where intensive grazing occurs. The cyst can survive for weeks to months in cold water. Escherichia coli (commonly abbreviated E. coli) is a bacteria commonly found in the lower intestine of warm-blooded organisms. Most E. coli strains are harmless, but some can cause serious food poisoning, gastroenteritis, urinary tract infections, and neonatal meningitis. The harmless strains present in the gut however, are beneficial, producing vitamin K2 and preventing other bacteria from colonizing in the intestine. Salmonella is another bacteria belonging to the same family as Escherichia, which is found worldwide in both cold-blooded and warm-blooded animals, and in the environment. They cause illnesses such as typhoid fever, paratyphoid fever, and food poisoning. The bacteria is known to be able to exist in a bathroom setting for weeks following contamination. The bacteria are not destroyed by freezing, but UV light and heat accelerate their demise and they perish after being heated to 55 °C (131 °F) for 90 min, or to 60 °C (140 °F) for 12 min. To protect against Salmonella infection, heating food for at least ten minutes at 75 °C (167 °F) is recommended, so the centre of the food reaches this temperature. Hepatitis A symptoms include fatigue, fever, abdominal pain, nausea, diarrhea, weight loss, itching, jaundice, and depression. SARS (Severe Acute Respiratory Syndrome) symptoms include fever, myalgia, lethargy, gastrointestinal symptoms, cough, and sore throat. With the risk of sounding redundant, you never want to drink tap water! However, it’s not limited to tap water. There’s well water, rain water, surface water, and the one that almost always slips through the cracks…ice! The obvious alternative is to purchase bottled water (the more familiar the label, the better) but that’s not always available especially in remote areas of the world. Water quality can vary considerably around the world, especially in developing countries. Water can be linked to one-third of the illnesses travelers will encounter on their journey, mostly caused by animal or human contamination. A water filter cleans the majority of the imperfections in the water. Filters usually use a gravity-based device to sift small bugs, major particles and bacteria from the water source but are not effective on smaller viruses. Often charcoal (a carbon-based filter) is used or a cluster of hollow-fiber tubes. Lifestraw is an award-winning device that claims to filter 99% of waterborne bacteria, protozoan cysts, and particles down to 0.2 microns. Water can also be purified (disinfected) by some chemicals and chemical-based devices. Iodine is the most common additive. Use 8 drops of iodine per liter of water and let rest for 30 minutes before consuming. This process should be avoided if the consumer is allergic to iodine, has a thyroid condition, or is pregnant. Chlorine dioxide tablets meet EPA guidelines for effectiveness against harmful waterborne microorganisms, including viruses and cryptosporidium. A SteriPEN is an effective, compact, and economically efficient alternative. Not only are most models reusable for 3,000 water treatments but it kills 99% of viruses and bacteria. 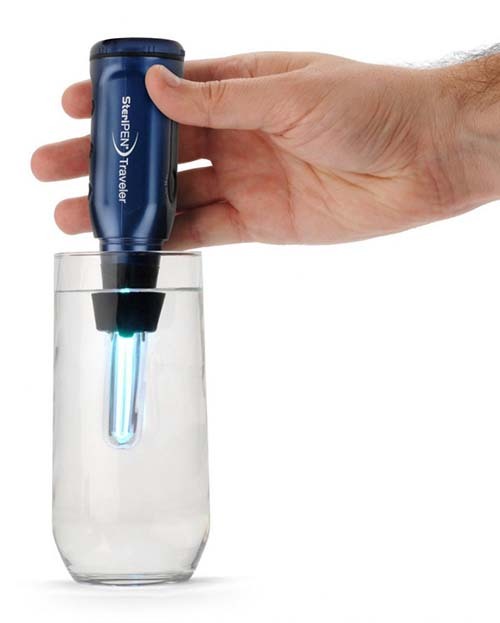 The SteriPEN uses UV light to kill microorganisms, purifying one liter of water in just 90 seconds and needing only battery replacement to operate until the light bulb runs out. It has the ability to disable viruses that cause hepatitis, gastroenteritis, polio, SARS.. in addition to bacteria and protozoa. Some of the disadvantages with a SteriPEN are that the water needs to be clear and colorless because UV cannot penetrate particles. If no other option is available to you and you have access to a heat source this method will kill all waterborne bacteria. Bring to a rapid, rolling boil for a minimum of 3 minutes as the most heat-resistant bug out there is the virus hepatitis A. It is believed to be able to survive for up to one minute in water heated to 98 °C (208 °F). It is important to remember that higher altitudes will also require a longer boil time. 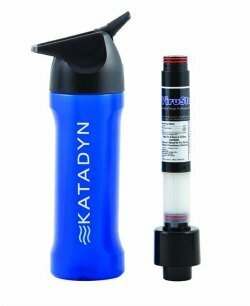 Combining multiple purification methods is always going to be an excellent idea and the Katadyn MyBottle Purifier does just that in a well-designed water bottle. When available bottled water is the easiest and safest choice. Make sure the seal is unbroken and do not leave bottles out without tops to avoid risk of contamination. (while we do suggest bottled water, please be aware of the environment and recycle your empty bottles). This is possibly the most common cause of travel sickness. People often don’t realize that the ice in their drink more than likely started its life as untreated tap water. Where possible avoid drinks with ice unless you have access to a freezer and ice trays with which you can use filtered water to make your own clean ice. Freezing water does not kill germs and bacteria but instead preserves them. (Even in alcoholic beverages; the alcohol will not kill the bacteria). Of course when one travels your consumption is not limited to water. With that being said you need to be mindful of your fruit juices, tea, coffee, and alcohol. Hot teas and coffee are typically not something to be too worried about as they’re brewed by scolding hot water. Although, the mass population tends to use cream or milk in those particular beverages it’s imperative that one be aware of where that milk or cream came from. Is it pasteurized? Has it been refrigerated? Is the packaging sterile and un-tampered? The juice that comes directly from the fruit is considered sterile but has a small chance of contamination during extraction as most juices are produced from the local water supply and/or contain ice. Freshly prepared coconut water is a wonderful alternative to fruit juices in a tropical climate and a much safer choice. This is a tricky one… while carbonated drinks are definitely considered on the safe list, the added sugar is never great for your health. Another consideration is to be mindful as aspartame (sugar alternative in diet drinks) and caffeine can aggravate the gut, especially in those susceptible to stomach issues. Use a straw when drinking directly from a bottle or can as the rim could be rampant in bacteria depending on where it has been stored and how it was handled. Most alcoholic beverages are distilled and bottled and safe to drink. It’s when you’re sitting on the beach in Thailand and decide to kick back a couple Sang Som and cokes with ice and wake up in the middle of the night wanting to die of stomach pain and don’t know why…it’s probably the ice. The ice in foreign counties is also almost always produced from the local water supply. Have some patience, buy your booze early and stick it in a cooler. It’s worth the wait! Alternatively, forgo ice altogether for a much safer option. The terms “Delhi Belly” and “Montezuma’s Revenge” are no joke. When it comes to chowing down, well, there’s the obvious: avoid eating raw or undercooked meat, wash your hands before eating, and wash all your fruits and vegetables thoroughly. Those standard “rules” will certainly help you avoid the aforementioned but it’s going to take a little more than that. This goes back to the proper treatment of water. You can wash your leafy greens all day long but if they’re not going to be cooked entirely and you’re washing them in contaminated water you’re not doing yourself or travel partners any favors. Take caution with these foods!! Raw or undercooked foods such as fish, shellfish, meat (especially chicken) and eggs. Unpasteurized dairy products (butter, cheese, milk, mayonnaise, yogurt and ice cream). Unpeeled fruit or vegetables including salads. Any food that has not been properly stored or refrigerated. Sandwich meats and buffets are best to be avoided. Do your best to avoid dairy. That’s including but not limited to milk (some of which you don’t know what animal it actually came from), cheeses, butter, and ice cream. Mainly because you can’t be too sure how long it has been traveling from one place to another unrefrigerated. Rest assured you can still have your sweets! Cookies and cakes and breads are all ok to eat. The pathogens that cause intestinal problems do not grow on dry surfaces. One word: delicious! But, if you’re unsure as to how it’s being prepared it’s best left to be avoided as shellfish are bottom feeders and pick up a ridiculous amount of bacteria before hitting your stomach. Let’s just say the repercussions are a trip ruiner; parasites, tapeworm, hepatitis are all issues that could be suffered due to a poorly prepared or uncooked oyster or mussel. There is one simple rule that you must follow when it comes to fruit. If you can peel it, you can eat it! Doesn’t get much easier than that really. By peeling your fruit you eliminate any contamination from the surface, which has most likely been in contact with fertilizer or compost. Food safely prepared/cooked by you or your travel buddy. Freshly cooked and thoroughly cooked food (boiled, steamed, fried). Familiar food brands in sealed containers or cans. Granola, nuts, dry cereal, and baked goods are generally considered safe. Street food is ready-to-eat food sold in a street or other public places, such as a market or fair, by a hawker or vendor, often from a portable food booth, food cart or food truck. While some street foods are regional, many are not, having spread beyond their region of origin. Most street foods are also classed as both finger food and fast food and are cheaper on average than restaurant meals. Despite concerns about contamination at street food vendors, research shows the incidence is actually not too dissimilar to that of restaurants. Most national health boards advise against eating street food completely. Especially raw or undercooked meat and seafood, cooked foods served at room temperature and raw fruits or vegetables that you haven’t washed and peeled yourself in filtered water. Of course, you would be missing out on so many incredible culinary experiences and who wants that! Observe the vendor before making your purchase. Do their hands look clean? Does the vendor keep hot foods hot and cold foods cold? Are raw foods kept separate from cooked foods? Acidic foods (Dishes with a high acid content such as those made with vinegar, lime juice and fermented dishes are generally thought to be safe. Food made with these techniques could potentially be kept for months without refrigeration. Some spices, such as chili and turmeric, are known to have anti-bacterial properties so spice up your dishes. The busier the street vendors the better. A busy vendor generally means good quality. Think about it, locals wouldn’t keep coming back to eat if they were getting sick. This rule can be applied to restaurants also. Be aware of local meal times. Arrive a bit before meal time, when foods are not long off the burner and before they’ve been attacked and even handled by other customers. As a precaution, consider taking a pro-biotics such as those found in some cultured milk products like yogurt. These ‘friendly’ bacteria can assist your immune system in fighting off harmful bacteria. Keep in mind that these are guidelines. You can never escape food borne travel illness completely but these are certainly some ways to dodge that bullet. Always be mindful yet at the same time be open-minded. Sounds conflicting but try new things, adventurous things… just try to make sure that whatever you’re trying hasn’t been washed in contaminated water. Remember to ALWAYS wash your hands with soap or carry alcohol-based hand sanitizer before eating. Even if your food is properly prepared, bacteria can be carried from your hands to your mouth. Your best defense against foodborne illness is to be as informed as possible and using your common sense. A great option before traveling is to consult the World Health Organization and/or the Centers for Disease Control and Prevention. 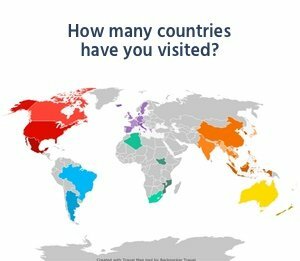 These sites monitor outbreaks which will allow you to see if there are any active threats where you are visiting.